Micro-needling is an innovative new way to treat skin affected by acne or the signs of aging. Also called CIT or Collagen Induction Therapy, automated micro-needling is designed to achieve the controlled “injury” to the skin. When hundreds of tiny injuries occur in this safe manner, the body responds by producing the healing substances elastin and collagen. Through this repair process, the skin becomes smoother, softer, and more youthful in appearance. The creation of these micro-channels in the skin also facilitates the absorption of topical skin nourishing products. Dr. Blose chooses the most advanced, proven products and instruments to treat his patients’ concerns. The Eclipse MicroPen™ fits right into his high standards for medical-grade equipment. Before the development of the MicroPen™, dermal needling was performed with an instrument called a dermal roller. This hand held instrument features hundreds of tiny needles around a wheel that is rolled across the skin. As the dermal roller moves, the skin is pierced by the needles. The response of this technique versus automated micro-needling is the same: increased production of collagen and elastin. The actual process, however, can be very different. Due to the vertical direction of the Eclipse MicroPen™, the skin is pierced with a much greater degree of precision. The consistency of automated micro-needling can produce better results with less discomfort. The Eclipse MicroPen™ contains 12 fine micro-needles on its tip. Treatment begins with the application of a topical gel. MicroPen™ is adjusted to the appropriate setting for your specific needs. The pen is pressed gently against the skin and will gradually glide across the surface, producing thousands of microscopic channels in the treatment area. After treatment, increased collagen and elastin production may continue for up to six months, progressively improving the look of the skin by rebuilding a healthy foundation. Advances in aesthetic medicine have made it possible for more people to have better control of the way they look. 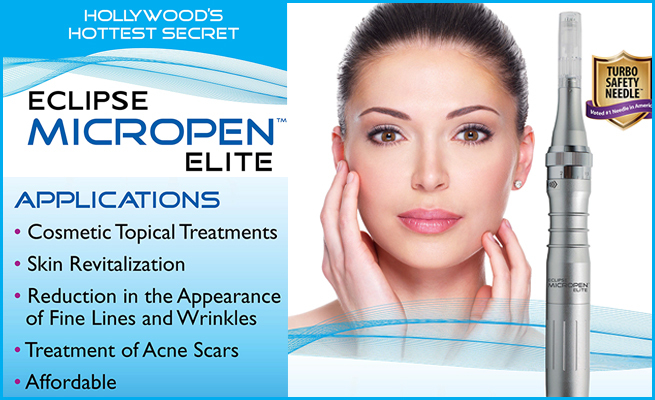 To learn more about treatment with the Eclipse MicroPen™, call (562) 923-6450. Dr. Blose has offices in Downey, and Montebello.